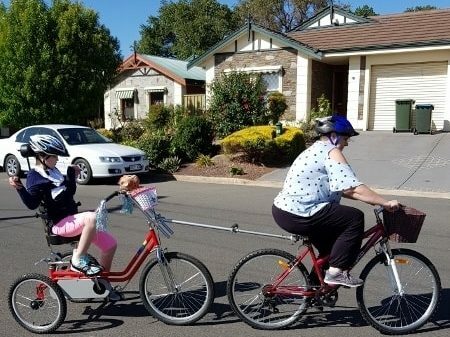 Tow-bar/pole for bike - TADSA - Technology for Ageing and Disability (SA) Inc.
TADSA volunteer Des Chabrel was asked to make a tow-bar to facilitate towing a trike behind a bike. This is the second one he has built and he incorporated modifications made by the original client’s Dad. 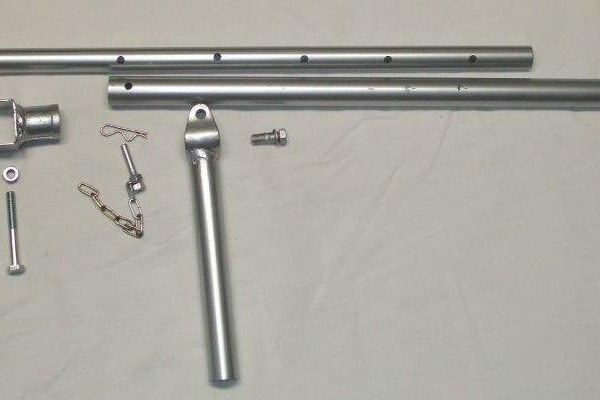 The tow-bar is made of a steel tube with couplings at both ends to attach it to the bike and the trike. At the bike end is a universal joint and a swivel to allow for all movements by the bike. The connection to the trike is much simpler allowing vertical movement only. Any left to right movement at the trike end turns the front wheel and steers the trike to follow the bike. The bar can be taken apart at the midpoint and used as a tow handle so the trike can be pulled by a parent. Presently, the pedals rotate whenever the trike is moving but an aftermarket modification is available from BODY CYCLES to allow the pedals to be engaged or disengaged. Des says “The front connection was a bit tricky but after that was sorted the remainder of the project was quite straightforward.” (Maybe for you Des!). “Thank you to TADSA for this lovely pole, as it gives me the freedom to take my daughter and myself as well as my partner on a bike ride. This has made a very big difference in my daughter’s life. She can ride with either of us on the path. Once again thank you for this pole.” Sheila, the client’s Mum.